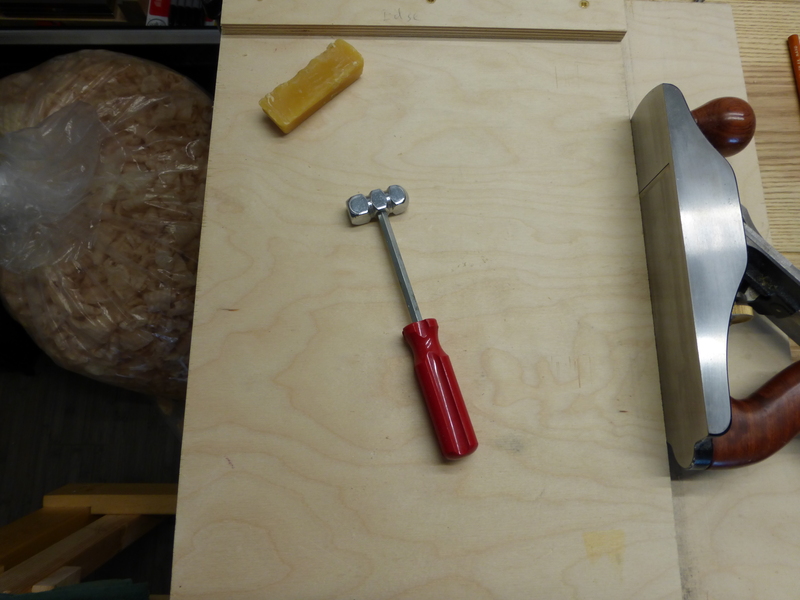 It occurred to me the other day that I’ve never actually used the lateral adjustment lever on any of my hand planes. One of the first woodworking videos I ever watched was Super-Tune a Hand Plane by Christopher Schwarz and I guess I got in the habit of doing all blade adjustment by hammer tap. I think I stole this one from my father’s toolbox. Given all the smoothing and shooting I’ve been doing lately for the mini-workbench project (both with my No. 4 and my No. 4 1/2), I have gotten quite a bit of practice at resharpening and plane setting. One thing I noticed is that my plane irons were apparently ground out of square (I blame the wide blade attachment on my Work Sharp 3000). After some clean-up in that respect, getting perfect set after a resharpen is much quicker. I’ve also been more diligent about lubricating the plane sole (see the beeswax above). It’s the little things, I guess, that increase efficiency.